A portico is basically just a roof that shields the entry door to a home against rain, without taking up much space. It can also be a decorative element to give a house special character. Porticos can be very ornate, with scrollwork and other decorative touches, or just a basic roof above a door. You can buy a portico, or you can make one to your own design if you have carpentry skills and tools. Set two 4-by-4 or 6-by-6 inch posts at the outer corners of the portico area. Fasten metal post brackets to the porch with concrete nails. Make the posts the same height as the space above the door frame where the portico will be attached. Secure the posts with galvanized screws through holes in the brackets driven in with a screw gun. Remove the house siding in the portico area and position a 2-by-6 inch ledger board the width of the portico. Use a level to make sure the ledger board is even along the house framing then tack it into place with framing nails and a hammer. Drill pilot holes with a power drill and 3/8-inch bit into the ledger and the house framing. Fasten the ledger with 1/2-inch lag bolts long enough to extend through the sheathing and at least 1-1/2 inches into the framing. Drive these in with a ratchet wrench. Add a similar horizontal board across the tops of the posts. Connect the two ledger supports with 2-by-6 or 2-by-8 inch beams on either side of the portico. Nail these to the ledgers with 16d framing nails and a hammer to make an outer frame for the portico roof. Buy two or three prefabricated trusses, depending on the size of the portico, of the desired pitch for the portico roof. Get basic king post trusses, with a bottom chord to sit on top of the side beams, rafters that are angled to a peak and a center post between the peak and the bottom chord. Lift the first truss to the roof upside down, starting with the house side. Nail the first truss to the wall framing and the beams on both sides. Raise other trusses and nail them to the beams. Use three nails per truss, two on one side of the truss board and one on the other side. Use a level to make sure they are plumb. Cover the roof with oriented strand board decking that extends at least an inch past the edges on both sides and 3 inches past the outer end. Install metal flashing on the house wall to extend over the decking to seal that seam. Overlap flashing at the roof peak. Put drip flashing on both sides and at the gable ends. Nail the flashing with shingle nails. Put a 2-by-2-inch nailer board under the outer roof decking that conforms to the slope of the gable. Nail this in with 8d galvanized nails. Cut a sheet of 1/2-inch plywood to fit between the nailer strips and the bottom of the truss chord to sheath the gable end of the portico. Lay down roofing paper with a construction stapler and shingle the roof. Start at the bottom on each side with a full shingle that has the tabs cut off with a utility knife. Nail this with the cut edge up and the bottom even with the edge of the decking. Cut the width of one tab off a shingle to start the next row and add shingles on each side to the peak. 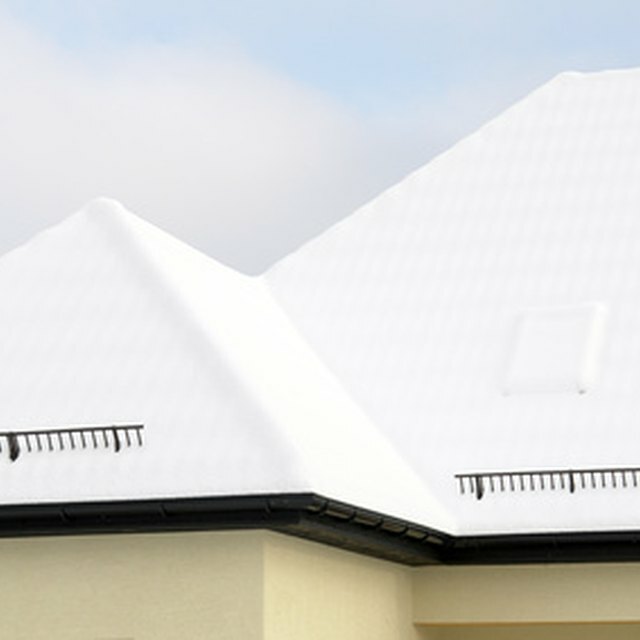 Cover the peak with cap shingles or with cut-off tabs bent across the top of the roof. Add 1-by-6 inch fascia or facing boards on the ends of the rafters on both sides and down the rake slopes of the gable end. Overlap the gable fascia over the ends of the side boards. Nail these in place with 8d galvanized nails. Cut 1-by-4 inch boards with a miter saw to make collars to go over the metal brackets at the bottom of the corner posts and at the top where they connect to the side beams. Re-install the siding on the house over the roof flashing.